Covers from Lithuania: Lithuania 1941 covers/Russian Occ. RUSSIAN OCCUPATION. 1941 (May) regis. (boxed R h.s.) 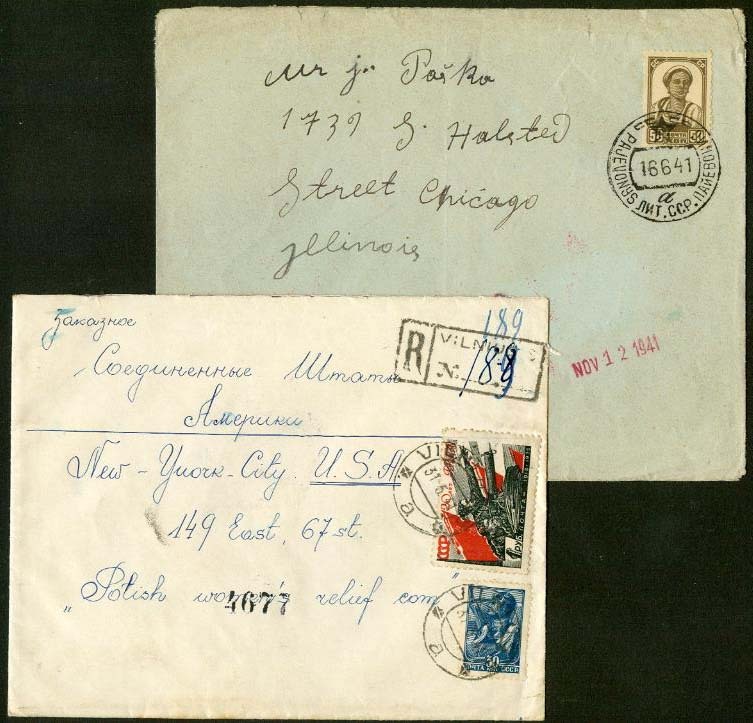 cover to Polish Women's Relief Committee in N.Y. (bkstp) franked with Russia 30k & 1938 Red Army 1r (#635) tied by VILNIUS "a" cds, plus 1941 (Jun 16) cover to Chicago (private arrival d.s.) franked with Russia 50k tied by SSSR RAJEVONUS LIT. SSR. PAIEVONIS "a" bilingual cds, few edge tears, Occupation lasted Jun 1940-Jun 1941 only, former F-VF, latter Fine.